The Classic Vibe Series shows off the best aspects of yesteryear and this 50’s Stratocaster certainly has the right look and feel about it. 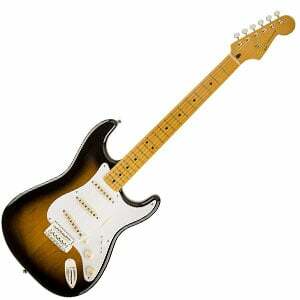 As you’d expect, it features the classic double-cutaway Strat body shape with a 25.5” scale length. The body itself is made from solid alder, and is comfortable and lightweight, making it a great match for beginners. This is covered in one of two retro finishes – either the 2-Color Sunburst or, our favorite, the Sherwood Green Metallic, which comes with a matching painted headstock. Bolted onto the body is a sleek maple neck that shows off traditional Strat playability, with a comfortable C shape, a maple fretboard and 21 medium jumbo frets. Both the fretboard and the neck feature a vintage-tint gloss finish, which enhances both the retro appeal of this instrument and the playability, delivering a smooth hand-feel. For a sub-$500 Squier, the fit and finish is very good with nicely dressed frets and a decent setup from the box. Onto hardware, and the Classic Vibe 50’s Stratocaster is loaded with the classic Strat configuration of three pickups, at the bridge, middle and neck positions. These are all Squier-designed Alnico III vintage-style single-coils, with staggered pole pieces. There’s nothing out of the ordinary in the controls either, with a master volume, individual tone controls for the neck and middle position (all three in aged white plastic for added vintage appeal), and a five-way selector switch. The six-saddle vintage-style synchronized tremolo bridge is another expected inclusion, as is the accompanying whammy bar. You’ll also find a set of sealed vintage-style chrome tuners on the headstock as well as a synthetic bone nut. Again, nothing extraordinary here, but the components are very reliable, keep your tuning very solid while retaining the groovy vintage style Squier is going for. When it comes to tone, the Classic Vibe 50’s Stratocaster certainly competes with guitars in a higher price range – it sounds great for the price! While they don’t deliver a true vintage tone, the trio of single-coils are very commendable and are perfect for blues, surf rock and Hendrix-style playing with lengthy sustain. The use of Alnico III magnets delivers a hotter output than you’d originally expect, so it’s also great for classic rock lead and rhythm when the gain is cranked up. Overall, the Classic Vibe 50’s Stratocaster gives you more than the price tag suggests it should. The comfort, value and simplicity will certainly appeal to beginners, but there is more than enough tone, style and playability to make it worthwhile for any experienced guitarist looking for a vintage-inspired axe. For more info about the Squire Vibe 50s, click here. love the ‘good beginner’ comment. it’s a decent guitar. the eval depends on your level of snobbery.